Take extra precautions when hiring folks to take care of loved ones. If you have entrusted the life of your elderly loved one to a caregiver, it is hard to imagine the person violating that trust by hurting someone you love. Unfortunately, elder abuse by caregivers is a very real issue. In 2012, the National Center on Elder Abuse reported that one to two million older Americans have experienced some form of elder abuse. According to the Administration on Aging, elder abuse is defined as “any knowing, intentional, or negligent act by a caregiver or any other person that causes harm or a serious risk of harm to a vulnerable adult.” There are many elder abuse types as they can be emotional, physical, sexual, or psychological. It can also come in the form of abandonment, neglect, or financial exploitation. 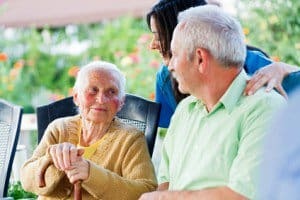 If you have an elderly loved one in someone else’s care, it is very important to be in touch with them frequently, and be on the lookout for any signs that they are being abused. Signs of financial abuse include a sudden change in financial standing, a lack of items your loved one could previously afford, your loved one loaning the caregiver money, and your loved one wanting to transfer property or give power of attorney to the caregiver. Signs of neglect include lack of food, hygiene products, or clean clothing. You may find your loved one’s home is unkempt and hazardous items are lying around. You may discover your loved one has bed sores from inadequate cleaning and exercise, or has been left alone unsupervised against your wishes. Physical abuse should be suspected in the event of any fracture, burn, sore, cut, welt, or bruise that does not have an adequate explanation. Psychological abuse is taking place if the caregiver is overly aggressive, controlling, or demeaning towards your loved one. If your loved one suddenly seems depressed and is withdrawing from activities they would usually enjoy; psychological abuse is a likely culprit. If you discover a caregiver in the act of abusing your loved one, please call 911 immediately. Otherwise, if your loved one is not in immediate danger, and you suspect they have been abused by a caregiver, you should contact the Adult Protective Services agency in your state for assistance. This agency, which will hold your report confidential, will determine the severity of the abuse situation, assign a caseworker to investigate, and help your loved one find local support and crisis intervention services if they are needed.